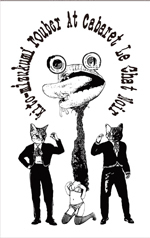 Kito-Mizukumi Rouber / "Kito-mizukumi rouber At Caberet Le Chat Noir"
It's KMR's neew great tombstone!! Live recording with new member "Mar mar sumol Ma rmar" on Sax.A number of famous songs. Fun songs that everyone can sing along shoot like a machine gun. Recorded KMR's exciting dance show with sheep and cows. listen and dance or die die ! 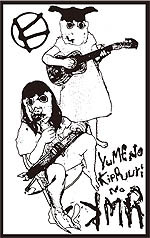 Kito-Mizukumi Rouber / "Yume No kippuuri No KMR"
It's 4th album of kito-mizukumi rouber. A collection of hit songs which all mankind should sing in chorus! More right on failings from every ones favourite acid enka freak out band. More broken avant-garde blues/failed garage rock than you could care to waggle your juicy double at. Numbered edition of 100, split release with chocolate monk in UK. 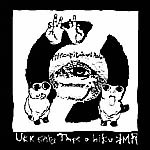 Kito-Mizukumi Rouber / "UKK kara TApe o hiku KMR"
This CD is not the same as released fromATTIC CASSETTES. New version that adds some newer track! broken avant-garde blues / failed garage rock. Factory-pressed CD in a mini-LP style card sleeve. Kito-Mizukumi Rouber / "Boseki ni Tatazumu KMR"
Kito-mizukumi rouber is Acid garage Enka(style of Japanese old song) that failed music. They are strange dance bands. Factory-pressed CD in a mini-LP style card sleeve.